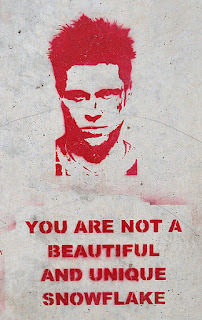 Fight Club, written by Chuck Palahniuk in 1996, is a commentary on the state of humankind in the end of the 20th Century, and a critique of society, at least Western society, during that time. With Fight Club 2 released in comic book form starting in May 2015 and continuing into 2016, it is a story that continues to be compelling and relevant. The book’s opening sentence – “the first step to eternal life is you have to die” (11) – is one that delves into questions surrounding the nature of humanity, and is a lead-in to the many foci of the book, including identity, consumerism, spirituality, and gender. The main character and narrator, a man who is anonymous, finds himself estranged from his job and suffering from insomnia. Part of his therapy is attending multiple self-help groups, at which he lies about having the condition addressed by that specific group, in order to create or discover meaning in his life and to improve his sleep. However, his ultimate therapy comes when he ‘meets’ Tyler Durden, with whom he creates Fight Club. The content of the resulting meta/physical journey and its commentary on human nature align well with certain Christian beliefs, and show both the issue of alienation in post/modern humanity, and that the road to redemption involves navigating a path of intense trial and tribulation. In Fight Club, Palahniuk conveys the notion that humanity as a whole is composed of beings that are out of touch with themselves. Readers are shown first through the main character, and subsequently through the individuals that join Fight Club, that the majority of individuals lead untrue lives: a false-self is projected and engaged with, while the true-self is repressed and hidden. The main character is left nameless which points to his anonymity, perhaps because of his routine and mediocre life. 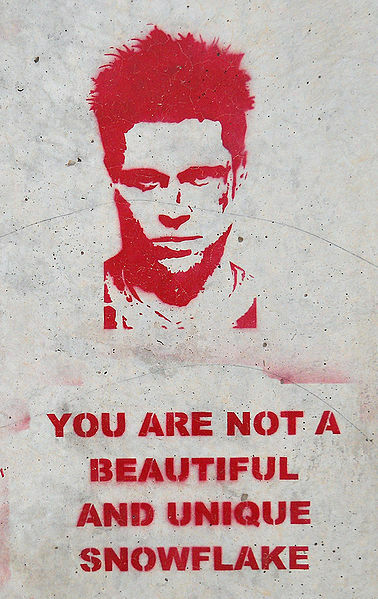 However, readers learn through the course of the novel that Tyler Durden is a manifestation of the anonymous narrator. Commentator Renee Lockwood says that this split personality is the ultimate act of consumerism, but “ironically represents the very empty and transient aspect of consumer culture against which a kind of holy war is waged.” While a portion of the identity issue is explainable by consumerism, Tyler Durden can be seen to represent a truer and more in-touch-with-himself version of the narrator, and so is named. Palahniuk conveys that it is through the act, or continual acts, of giving up one’s self, especially (desire for) possessions, that one will be ‘saved’; that perhaps self-destruction should be sought instead of self-improvement. However, it is through this paradoxical act of self-destruction that self-improvement is attained. “Tyler says I’m nowhere near hitting the bottom, yet. And if I don’t fall all the way, I can’t be saved. Jesus did it with his crucifixion thing. . . Only after disaster can we be resurrected. ‘It’s only after you’ve lost everything,’ Tyler says, ‘that you’re free to do anything.’” (70). St. Paul talks in numerous places (Rom 7, Gal 2:19-20, Phil 3:7-8) about our two natures, dying to self, and considering everything rubbish compared with knowing Christ. Losing one’s self and giving up (the desire for) material possessions, to a degree, is an important biblical concept. Yet the Bible makes clear that this is done for and because of Christ, not for any other reason. Fight Club, while not lining up completely with biblical teachings (likely not Palahniuk’s intent), is a book that can illuminate Christians to issues of possessions and consumerism, and remind them of different ways of dealing with these prevalent problems. So, nearly 20 years after Fight Club was written, and with Fight Club 2 currently in production as a comic book, where does humanity stand in relation to the issues raised by Palahniuk? Have we solved the problems of identity, consumerism, gender, and spiritual malaises that he raises? No, we definitely have not. But perhaps, maybe due in small part to Fight Club, we are engaging in more earnest dialogue about them, and that is better than nothing. While Fight Club was made into a movie a few years after the publication of the book, this post will focus on and reference the book only. There may be times when other sources are referenced that do refer to the book and/or movie. Renee D. Lockwood, “Cults, Consumerism, and the Construction of Self: Exploring the Religious within Fight Club,” Journal of Contemporary Religion 23, no. 3 (2008): 322. Lockwood, “Cults, Consumerism, and the Construction of Self,” 322. Nancy Bauer, ‘Cogito Ergo Film: Plato, Descartes and Fight Club’ in Film as Philosophy: Essays on Cinema After Wittgenstein and Cavell, ed. Rupert Read & Jerry Goodenough (New York: Palgrave Macmillan, 2005), 51. Justin Garrison, “‘God’s Middle Children’: Metaphysical Rebellion in Chuck Palahniuk’s Fight Club,” Humanitas 25, nos. 1&2 (2012): 85-86. John M. Stroup and Glenn W. Shuck, Escape into the Future: Cultural Pessimism and its Religious Dimension in Contemporary American Popular Culture (Waco: Baylor University Press, 2007), 91. Mark Novak is a Junior Member at the Institute for Christian Studies. He is currently pursuing an MA in Philosophy with interests in philosophical and theological anthropology, and the religious turn in contemporary continental thought. Image used is in the Public Domain, used from Wikipedia. Mark, this is excellent, makes me want to pick up this book, is it a movie also? At any rate, I was "weaned" in philosophy way back in the 1960s by Os Guinness, Francis Schaeffer, Udo Middlemann and others from the L'Abris group, as they were the first to introduce me to looking at culture and its philosophical connections, which you do very well here, I hope you do more of it!